Industry sales of stacked stone panels have been rising steadily each year for the last five years. While we cut and split individual natural thin stone from New England – all day every day – we see customers from every region of the country choosing stacked stone panels. Here are the pros and cons of these panels. PRO: Stones are cut, fit, and glued together into an interlocking panel with no mesh backing. This significantly reduces onsite cutting and allows for a much quicker install. CON: The panels still have to be handled carefully during installation to avoid breakage. PRO: The panels fit together without modification. The seams are offset and disappear when you stagger the panels by 1/3 of their length. CON: If you don’t stagger the panels, you will see a stepped stairway seam. PRO: Panels have matching corners that interlock perfectly with one short, and one long side. This allows for weaving back and forth to stagger the joints. CON: to shorten a corner, you’ll need to make stepped cuts using a wet saw. The same applies to flat panels. PRO: Panels install much faster than individual stones. A stonemason can install 100 square feet a day.CON: For larger vertical walls it is best to install three vertical feet, then let the mortar adhere for 24 hours prior to installing the next section above it. PRO: You don’t have to worry about selecting individual stones. CON: You can’t create a custom mix of stones or colors but there are plenty of beautiful colors to choose. 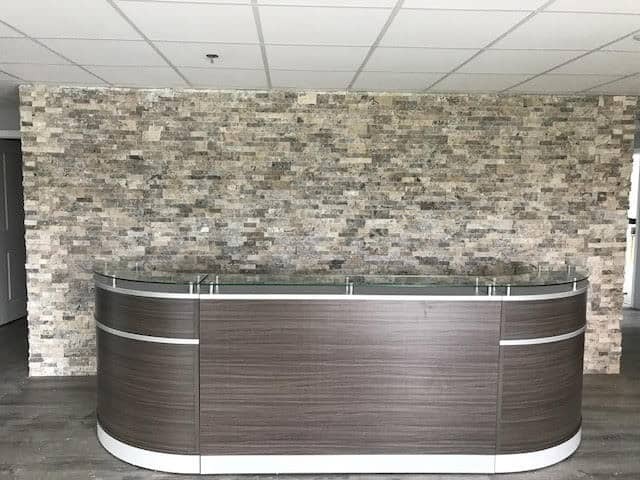 See our selection of stone panels.